In recent days political leaders from both major parties have spoken out against the coarseness of our political conversation. Something is afoot in the land, and it seems as if that would be a lack of generosity of spirit. If we’re honest with ourselves, we’ve all contributed to this coarseness. Our Disciples mission statement speaks of being a movement of wholeness in a fragmented world. It does seem as if the brokenness and fragmentation of our world is now fully out in the open. If there is a lack of generosity of spirit in the land, how will we as followers of Jesus respond? I raise this question on Commitment Sunday. This morning we bring to a close our annual stewardship emphasis, the “Journey to Generosity.” It’s time to turn in our commitment cards so that budgets can be made and plans made for the new year. We’ll have a party after church, with good food and good conversation. As we make these commitments, large and small, we begin imagining the congregation’s future. As we ponder these cards, deciding what to give or if we’ll give, we need to ask: Who are we as a people? How is our life together a reflection of God’s realm? Yes, these are the kinds of questions we need to ask as we continue along this journey to generosity. While the stewardship season nears its end, the journey to generosity will not end. I realize that this is the last Sunday of October, but the reading for today from the Gospel Matthew takes us to that Monday of Holy Week, the day after Jesus’ Triumphal Entry. Good Friday is on the horizon, but for now Jesus is standing in the Temple facing questions from religious leaders who seem intent on trapping him in some kind of theological misstep. After one religious party, the Sadducees asked Jesus about marriage and resurrection, a group of Pharisees, people who cared a lot about personal holiness, asked Jesus which law was most important. Instead of picking one of the Ten Commandments or one of the other 613 laws found in the Old Testament, Jesus highlighted two summaries of the Law. The first commandment called on the people of God to love God with heart, soul, and mind. That is, God’s people should love God with their entire being. 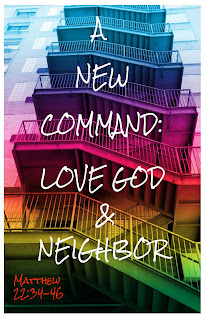 Second, God’s people should love their neighbors as they love themselves. On these two commandments, Jesus declares, “Hang all the Law and the prophets.” Yes, all scriptural commands are summarized in these two commandments. If you fulfill these two commands, you fulfill them all. 4 Hear, O Israel: The Lord is our God, the Lord alone. 5 You shall love the Lord your God with all your heart, and with all your soul, and with all your might. 6 Keep these words that I am commanding you today in your heart. 7 Recite them to your children and talk about them when you are at home and when you are away, when you lie down and when you rise. 8 Bind them as a sign on your hand, fix them as an emblem on your forehead, 9 and write them on the doorposts of your house and on your gates. (Deut. 6:4-9 NRSV). Not only should we love God with our entire being, but we should pass on this message to the children. Let them know how important it is to love God with their entire being. Then find ways of meditating on this word from the moment one rises in the morning to the time one goes to bed. Finally, leave plenty of reminders, so you don’t forget to love God with your entire self! This morning we’re talking about stewardship, which in its essence is our response to God’s love. By sharing our time, our gifts and talents, and our money, we respond to God’s loving embrace. We do this in our worship, as we lift up praise to God and declare our allegiance to God. And, in times like this it’s important that we are clear about our allegiances. It’s also good to remember that the word worship is taken from an old English word that means “ascribing worth.” So, when we sing and pray, we’re ascribing worth to God. When we worship, we give thanks to the Creator with grateful hearts for all God’s love, faithfulness, and provision. We like sheep may go astray, but the Good Shepherd is always ready to welcome us back into the fold. In its essence, stewardship is an act of worship, a way of giving praise to God by spending dedicated time in God’s presence, by making use of God’s gifts, and by sharing of our financial resources so that the gospel can be proclaimed from this place to the ends of the earth. This is why we take an offering each week. This response to God’s love is then reflected through love of neighbor. This call to love our neighbor, like the first commandment, is drawn from the Old Testament scriptures. In Leviticus 19, in the midst of what scholars call the “holiness code,” we find this brief statement, that directs our attention outward, toward others. To be holy, as God is holy, is to love our neighbor. While the author of Leviticus may have limited the definition of a neighbor to a person of one’s own nation or tribe, surely we, as followers of Jesus, can expand that definition to include all of creation. Since we are all part of God’s creation, we show our love of neighbor by being good stewards of God’s riches present in creation. The singular foundation of our identity is God’s act in Christ of extending welcome, hospitality, and friendship to us. This divine welcome, a welcome to us without consideration of individual or collective social worth or merit, draws us into the life of God and makes us God’s family and friends. [Jipp, Saved by Faith and Hospitality, p. 177]. Yes, hospitality is an act of stewardship that extends God’s love outward to the stranger, and therefore to God. When we speak here of love of God and neighbor, we’re not talking about feelings. This is not a Barry Manilow song. Instead, we’re talking about actions. Ron Allen writes that in the ancient world, “to love was to make a conscious choice to act for the good of another person and the good of community.” Stewardship is a reflection of that conscious choice to act for the good of the other. I believe God acts lovingly all the time. When creatures respond well to God’s loving action, positive things happen. Such love promotes overall well-being, or what Christians call blessedness, shalom, abundant life, or salvation. God’s uncontrolling love does good! [Uncontrolling Love, p. 130]. While we might prefer at times a more authoritarian God who not only acts, but controls everything, doing whatever God pleases without any concern for our feelings, is this the God whom Jesus has revealed to us in his life, in his death, and in his resurrection? This morning I invite you to join me in prayerfully considering how to respond faithfully to God’s loving action, by returning that love through acts of praise and gratitude, and by loving our neighbors. May our journey to generosity continue beyond this morning, so that we might be good stewards of God’s abundant gifts, and share the love of God with all creation.